Boy, was that scary! Quite possibly among the scariest movies in recent years; that is until The Boy drops the ball in the last few minutes of the movie. Within the first few minutes of the film, there is already an overwhelming sense of dread and an anticipation of what horror lies in store for our protagonist. This is one of the films where the plot was nearly perfect and even scarily close to real horrific circumstances. Quite interestingly and uncharacteristic of this sub genre of horror, the previews do not give away all the scares nor do they lend to revealing the shocking turning point during the climax of the story. In many ways, the plot is a tribute to a more classic way of building a horror movie and I can appreciate the effort to channel the Master of Suspense. 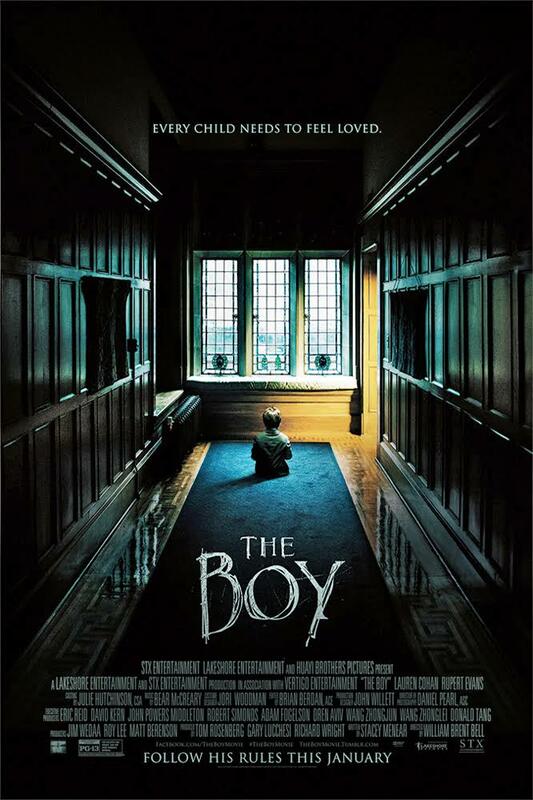 The Boy is about an American nanny who takes a unique position with an old-money family in the British countryside to look after the couple’s son while they are on a long awaited holiday. Upon meeting the child, Greta (Lauren Cohan) is perplexed as to why mom and dad are treating a porcelain doll as if he was their son. According to the parents, the doll IS their son and Greta must follow a strict set of instructions in order to satisfy the needs of Brahms (the boy). Worried she will be alone in this mansion with only the doll for company, Greta meets the attractive local grocery delivery man Malcolm (Rupert Evans) who informs Greta of the history of Brahms and his parents. Thinking that Brahms is merely a doll with obsessed parents, it isn’t long before Greta begins to feel that something is quite wrong after hearing voices and the doll mysteriously moving from place to place. Join Greta and Malcolm as they come too close to a long-kept secret with a devastating history. Despite being a January horror movie, The Boy had my attention and respect for a job well done until the end. Often horror movies may not provide us with the ending that we anticipated or were prepared for, but this film really took a turn for the worse when it played out in the manner in which it did. What I find remarkable about this modern old-school tale is the instant feeling of dread or fear of the unknown from the very beginning. From the dialog to the characters, each element of the story helps to continue to reinforce the ominous presence that Greta feels in the house. Unfortunately, there are just way too many unexplained, underdeveloped, and unanswered questions by the end of the movie to give the film the credit that it would have received otherwise. It is possible that the studio is setting up the audience for a prequel or a sequel, but usually these January movies do not see future installments. I really enjoyed the old-school pacing and feel of the movie, and if you also enjoy truly macabre suspense movies, then you will enjoy it for the most part (until the disappointing end). There was also a Hitchcockian air about the film; although Hitch would have directed a much better (or simply bizarre) ending and provided us with far fewer unexplained plot points. The film is definitely one that is very much enjoyed in a group setting, as is the case for horror in general. So, if you don’t have anything else planned to see this weekend, grab a few friends and head out to see what The Boy has in store for you. Sounds so creepy and macabre. I saw this movie it was awesome I screamed twice what a twisted ending. I am not a big horror movie fan. I saw the preview and did not think it looked scary it was.